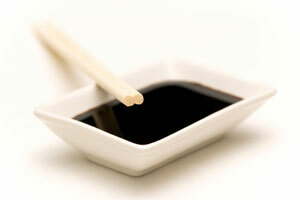 If you are following a wheat free or gluten free diet and you want to use soy sauce it's essential that you source the correct type as regular soy sauce is fermented with wheat. There are two versions of Tamari, one is wheat free and one is not wheat free. You must be careful to purchase the correct Tamari, so make sure that the label says 'wheat free' or 'gluten free', if it does not specify this then it almost certainly contains wheat and should be avoided. Many people who are cooking for a wheat allergic or celiac guest may not automatically recognise that Tamari comes in two versions, therefore, if they are intending to use Tamari in the belief that it is safe it may be helpful to check that they have the wheat free version. Wheat free Tamari can be substituted in the same quantities as normal soy sauce. Wheat free Tamari can be substituted anywhere that soy sauce is required. Tamari can be stored in the fridge, or kept in a cool dark cupboard, refrigeration will keep it at its optimum quality. Check the use by date, which is generally quite long.